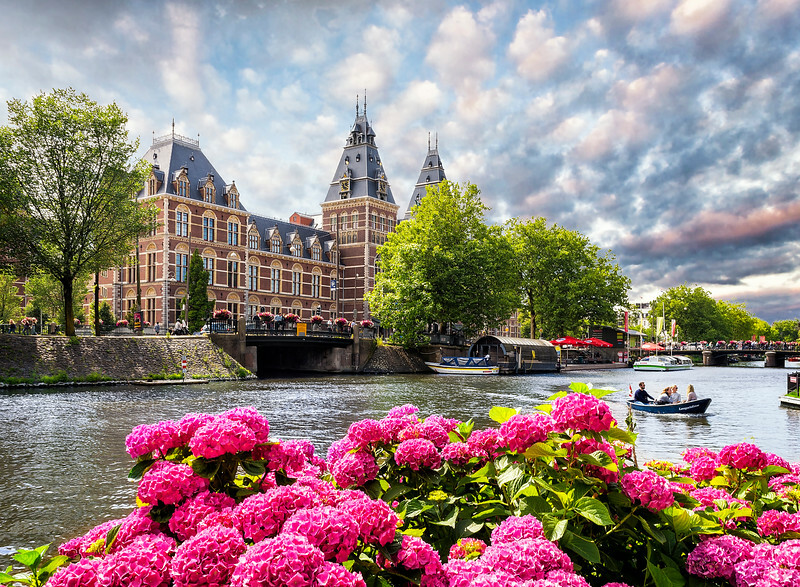 The Rijksmuseum is one of those "must see" museums when you're in Amsterdam. It's also a busy museum ... really busy. You can easily spend days in there seeing all the wonderful art. Upon leaving we found ourselves in the middle of the "International Yoga Festival." Quite a cool event and we hung out long enough to watch some performances, drink some health tea and don tee shirts devoting our lives to the world of Yoga. Finally making our way from the festival, I spotted a small street across from the museum that looked so peaceful. It was lined with trees and offered some pretty views. As I got closer to the museum across the way, I was able to get this pretty shot. There were so many boaters and I had to wait to get this little boat making its way around the canal.